Date of Birth: 1253 A.D. Date of Wisaal: 1325 A.D.
A legend is there that when Hazrat Amir Khusro’s first saw His Holiness Hazrat Syed Nizamuddin Aulia (R.A). It is said that young Amir Khusro went to His Holiness khanqah, but did not entered and remained at the door by remarking, "I shall select my "Peer" myself, and if it is bestowed with Divine Power he will converse with me even from distance." Tu an Shah-e-ke bar aiwan-e-qasrat. Kabutar gar nashinad baz garded. Be ayat andar un ya baz gardad. (You are such a mighty King that if a pigeon sits on your palace, it turns into a hawk. An outsider and a needy person has come at your door, please let him know whether he should come in, or go away). Azan rahe ki amad baz gardad." Hazrat Amir Khusro (R.A) immediately got up and ran to His Holiness and fell on his feet and wept! His Holiness accepted him as his disciple (murid) and gradually the two became inseparable and attached to each other. Love is deep rooted in human nature. Every Soul has a natural inclination towards another soul. Love in fact, –beautifies the soul, and beauty of the soul resides in love for humanity. Love, the Sufis believe is greater than religion. Love is the essence of all creeds. Every worshiper worships God out of Love. Love enslaves him. The true majestic welcomes love whatever its guise. One who has a perfect insight beholds God in everything. "Which ever way you turn, to God belongs the east and the west there is the face of Allah Taála. He is Omnipresent and All Knowing (Quran 2:115)." "Are they still in doubt as to their beholding the countenance of God? Do they not realise that God encompasseth all things? (Quran 41:54)." "Quran Sharif also points out "God is nearer to man than to any other thing." Hazrat Amir Khusro was a great Sufi, a wealthy merchant who once exchanged all his wealth for a pair of His Holiness Sultan-ul-Mashaikh shoes, an intellectual giant of many languages, an artist, a prolific author, a genius musician who invented the ‘sitar’, a versatile composer and a true devoted "mureed" of His Holiness. He was "All-in-One" type of highly amazing mixture of Divine gifts. Hazrat Amir Khusro (R.A) was the son of Amir Alachin a Turk from Laccheen. His actual name was Saifuddin Mahmood Shamsi. At the invasion of Gengiz Khan he migrated from his native place Kesh near Samarkand to Balkh. Saifuddin was the chieftain of Hazara. Shamsuddin Iltamish the King of Delhi welcomed them to his capital. He provided shelter to the dislodged prince’s artisans, scholars and rich nobles. Saifuddin was among them. It was around 626/ 360 A.H/1226 A.D. In 1230 A.D he was granted afief in the district of Patiali (in Etah District-Uttar Pradesh). He married to BiBi Daulat Naz, who bore him three sons and one daughter. Yaminuddin (Khusro) was one among them born at Patiali, presently known as Hazrat Amir Khusro Nagar in District Etah (U.P.) in the year 652-653 A.H/1252-53 A.D. Yaminuddin’s (Khusro) father Saifuddin was mostly engaged in battles, and was killed in 660 A.H/1260 A.D. Yaminuddin or Khusro was an intelligent child. Poetry came to him at the early age of eight. "My father Saifuddin Mahmood Shamsi, the renowned breaker of enemies ranks, possessed might, enough to conquer the world with all the merits of his inner self, he never spoke about his inherent goodness and behaved like an Angel. He was a military commander and a saint. Although he was highly educated and cultured, he loved martyrdom from the beginning and he drank ultimately the Sharbate-Shahadat." There is no country in the World whose cultural heritage is so much blended with divine touch. In Punjabi, Baba Farid and Nanak spoke in poem – thus the beginning of Punjabi literacy heritage. In Gujarat, Narsi Mehta and Meera Bai sang songs of the glory of Ranchchodji – thus the beginning of Gujarati Literature. In Kashmir, Lalleshwari and Nand Rishi (Sheikh Nurudedin) sang to the glory of God – thus the beginning of Kashmiri language. Urdu, (the rich language of India) was also born in the same fashion. His Holiness showed keen interest in the promotion of mutual love and goodwill among all classes of people. When His Holiness found that languages and dialectic obstacles clogged this harmony and hindered the understanding amongst the Afghans, the Iranians and the Turks and others, His Holiness ordered Hazrat Amir Khusro to invent a "new language" so as to facilitate inter-communication and homogenous oneness amongst the people of India. Hazrat Amir Khusro mixed the Persian with local Brij Bhasha (native language of the North) and this mixture laid the foundation of Urdu. With the passage of time and by its usage it developed into more refined Urdu cultural. Delhi is proud of His Holiness and Hazrat Khusro. Delhi is proud of Urdu. It was in Delhi that Urdu was born, nourished and flourished. Hazrat Khusro is the father of Modern Urdu Literature. He composed the first poem in Hindi too. He is the pioneer of Hindustani Literature. He was a great scholar in Persian. He introduced Sitar, the five string instrument. He was a pioneer of Indian Classical music. Hazrat Amir Khusro was not only a talented and highly learned poet of India having full command over Turkish, Persian, Arabic, Hindi and Sanskrit languages but he was a distinguished Sufi by virtue of his initiation and closeness to His Holiness. His poetical composition, specially the Persian-Hindi blending were aimed at cementing the bonds of culture and friendship between the Hindus and Muslims. Amir Khusro was a leading poet in Persian and Hindi languages. In his introduction to ‘Ghurratul Kamal’ Khusro wrote that, "a few poems that I have composed in Hindi I have made a gift to my friends." He was a Hindustani Turk. In another famous verse he said, "To speak the truth, I am an Indian parrot. If you want to listen from me some subtle verses, ask me then to recite some of my Hindi poems". "Though Hindus are not men of our faith, yet on certain points they hold concurrent ideas in respect of our faith. They affirm that life is one and eternal and that God created everything." He was the monarch in the field of prose and poetry. His Holiness, Hazrat Syed Nizamuddin Aulia (R.A) says, "He is our Khusro not Nasiri Khusro, May God help my Khusro". Amir Khusro remained wedded to truth, love and humanity. Amir Khusro was very promising child. He became a scholar of philosophy and science in short time. At the age of twenty, he became a famous poet. He was a man of soaring imagination. The greatness lies in his breaking the mistrust and isolation in the then existing various culture groups and thus paving the way for reconciliation at the social and ideological levels. Such conciliation and concord amongst them was a moral and intellectual demand besides being an urgent social necessity. 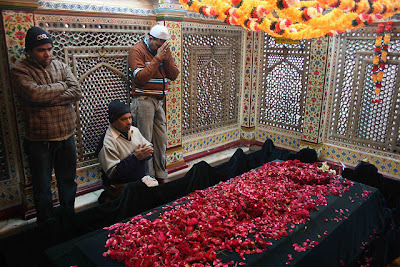 Hazrat Amir Khusro rose to a high status because of his connections in political circles and had opportunities of observing many important events from close quarters. He was a man of learning and helped the growth of Hindustani literary societies. His genius unfolded itself in poetry, music and prose. After his father’s death, he migrated along with his mother to Delhi where he was brought up by his maternal grandfather Imadul Mulk Rawat Arz. Mir Khurd writes that His Holiness Hazrat Syed Nizamuddin Aulia (R.A) came to Delhi at the age of sixteen for the purpose of his higher education in the profession of Qazi. By a strange turn of fortune he stayed in the same locality where Amir Khusro lived i.e. in Namak Sarai. After some time His Holiness Hazrat Syed Nizamuddin Aulia (R.A) shifted to Rawat Arz house on the recommendation of Hazrat Amir Khusro. He further writes that when Amir Khusro reached his adolescence he became "Iradat Kash" of His Holiness Hazrat Syed Nizamuddin Aulia (R.A). Amir Khusro writes in the preface to his "Diwan" "Wastful Hayat" that he was sixteen years old when he found His Holiness Hazrat Syed Nizamudddin Aulia (R.A) as his spiritual mentor, along with Mufti Moizuddin Gharifi. Both of them guided him to the path of following the style of Shaikh Sadi and Ispahani. Man himself is a mysterious being. His soul, spiritual powers, insights, intuitive faculties, contact with ultimate Reality and several other things have made him an enigma. "I am creating man from dry clay from black moulded loam. When I have fashioned him and breathed My spirit into him…" Quran (15:29). Dost az seenah um awaz bar arad kah manam." My beloved responds from inside my breast saying it is ‘I’. In kah tu beeni nah manam balkeh oost. Darnah gan ji bih wahm admiyan." Man himself is a mysterious universe unto himself with all his mental powers he cannot understand his own self. How can it be possible to understand Allah Tala? A free nandah ra kuja danad." (Those who realised himself has realised the Allah Tala (God)). "Do not insult a man by a bad word. For in everyone genuine Lord lives." "I went to the the church of the Christians and the place of the Jews. And saw that both are facing you. And I heard the idols singing Your love songs." "Love of country is like Love of religion." "Oh, group of believers! Love of the country is certainly like the real faith (in religion)." Hazrat Amir Khusro (R.A) believed, India with its beauty - is a Paradise on the earth!. "Kishwere Hind Ast Bahashti Bih Zameen". India is a country like Paradise on the earth. "Falak az u jumla amad hindustan bar tar guft har chah az ameen kishwer amad." Is the lot of Khusro blessed with Almighty Power." Hazrat Abul Hassan said that Amir Khusro heart was equally capable of responding with all the swirl and glow of passion, to the love of the Infinite. It is the cosmic emotion that vibrated through all his mystical ghazals, and they seem to have emerged out of the souls encounter with the Absolute. Hazrat Sheikh Khwaja Sayed Nizamuddin Awliya‎ (رحمتہ اللہ علیہ) (حضرت شیخ خواجة سیّد محمد نظام الدّین اولیاء) represents in many ways the pinnacle of the Chishti Order (Silsila). His spiritual guide, Hazrat Baba Fareed‎ (رحمتہ اللہ علیہ), said to him on appointing him as his successor, "Be like a big tree so that Allah's creation, the human beings in their vast multitudes, may find rest and solace under your shadow." This partly explains why he admitted so many men into the Chishti order as his disciples. Hazrat Nizamuddin Awliya‎ (رحمتہ اللہ علیہ) sent his well-versed and caring disciples to far-flung areas of Uttar Pradesh, Rajastan, Gujarat, Bihar, and Bengal amongst other places to spread the word of truth. Love: Sufism is, in its essence, the way of love. Love is considered to be a spiritual treasure through which the baser qualities of a human being are transformed into higher ones. In this respect, it suffices to say that Hazrat Nizamuddin Awliya‎ (رحمتہ اللہ علیہ) is known as Mehboob-e-Elahi, the beloved of Allah. Of course, the spiritual status of a beloved is much higher than that of a lover. Intelligence: Intelligence changed in the hands of Hazrat Nizamuddin Awliya‎ (رحمتہ اللہ علیہ) into wisdom. His wisdom manifested itself in the shape of service to humanity. About him it has been said: "He was not a miracle-monger of the ordinary sort. He never flew in the air or walked on water with dry and motionless feet. His greatness was the greatness of a loving heart; his miracles were the miracles of a deeply sympathetic soul. He could read a man's inner heart by a glance at his face and spoke the words that brought consolation to a tortured heart." Knowledge: About knowledge, it can be said that Hazrat Nizamuddin Awliya‎ (رحمتہ اللہ علیہ) was one of the greatest scholars of his day. He wished to become a Qazi (Islamic judge) but gave it all up in his pursuit of inner knowledge. “You are not my fellow traveller. Then Hazrat Baba Fareed‎ (رحمتہ اللہ علیہ) ordered him to take a tray of food from the kitchen and carry it on his head to his friend. After doing so, Hazrat Nizamuddin Awliya‎ (رحمتہ اللہ علیہ) recited the verse above which deeply moved his friend. What else do I seek other than meeting You? After leaving their homeland, the city of Bukhara in Uzbekistan, the paternal grandfather of Hazrat Nizamuddin Awliya‎ (رحمتہ اللہ علیہ) (Khwaja Ali‎ (رحمتہ اللہ علیہ)) and the maternal grandfather of Hazrat Nizamuddin Awliya‎ (رحمتہ اللہ علیہ) (Khwaja Arab‎ (رحمتہ اللہ علیہ)) along with their family, moved to India. At first they lived in Lahore, but later they took up their residence in Badayun (east of Delhi). Soon after, Khwaja Arab‎ (رحمتہ اللہ علیہ) married his daughter Bibi Zulaikha‎ (رحمتہ اللہ علیہ) to Khwaja Ali's‎ (رحمتہ اللہ علیہ) son Khwaja Ahmad‎ (رحمتہ اللہ علیہ). The birth of Hazrat Nizamuddin Awliya‎ (رحمتہ اللہ علیہ) took place on the last Wednesday of the month of Safar (the 27th of Safar 636 AH). Up to this day, his birthday celebration takes place on which his blessed shrine is bathed and the water thereof is distributed among the visitors. 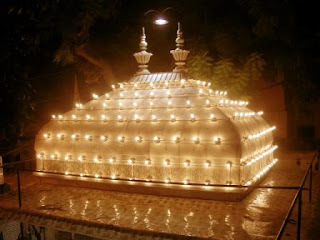 Hazrat Nizamuddin Awliya's‎ (رحمتہ اللہ علیہ) father passed away when Hazrat Nizamuddin Awliya‎ (رحمتہ اللہ علیہ) was five years old. His mother took him to a school where he learned to recite the Holy Qur'an. In a short time, he mastered the seven ways of reciting the Holy Qur'an. Then he studied Arabic grammar, Ahadith (sayings of Rasulallah ‎(صلى الله عليه و سلم) , commentary of the Holy Qur'an and logic. At the age of twelve, he received the "turban of excellence." He was so sharp-witted, wise and understanding that he was given the title "Debater, capable of defeating the congregation." He became distinguished in the science of Tafsir (commentary on the Qur'an), in the knowledge of Ahadith, in Fiqh (Islamic Jurisprudence), mathematics and astronomy. Khwaja Shamsul Malik‎ (رحمتہ اللہ علیہ) was among his most learned teachers. He received a testimony of knowledge of Ahadith from Mawlana Kamaluddin‎ (رحمتہ اللہ علیہ). 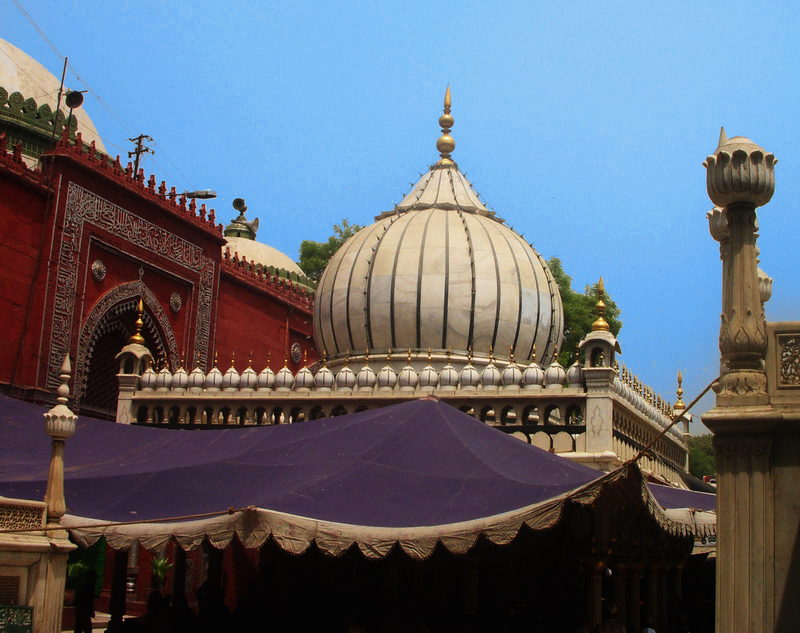 Although Hazrat Nizamuddin Awliya‎ (رحمتہ اللہ علیہ) used to sit among the Ulema (scholars of Islam) during that time, he was more interested in the inner life. He often used to say, "In the days of youth, I used to live in the company of the Ulema, but in my heart the thought used to come that I should go away from their company and turn my face to the Divine Teacher." If Rabi-ul-Awwal is the month of the greatest Prophet of Allah then Rabi-us-Sani, is the month of the greatest Saint of Allah. If the Prophet drew the veil on this world to meet his Creator on the 12th of the month, the Saint departed on the 11th of the next month, as if as a mark of distinction from the Almighty Himself. The name of this greatest of the great Saints is Hazrat Syed Shah Abu Mohammad Muhyuddin Abdul Quader Jilani Al-Hassani wal Hussaini ShaenenLillah (Alaihis Salam). Many are the honoured titles of this great saint, Muhyiuddin (the Reviver of the Faith), Peer-an-e-Peer (the Spiritual Teacher of Spiritual Teachers), Mahbub-e-Subhani (the Beloved of the Supreme), Ghaus-us-Sakalaen (the Ghaus of both worlds), and Kutb-e-Rabbani (the Cardinal Star of the Lord) and many others, but the most well known and respected being Ghaus-ul-Azam (the Supreme Spiritual Helper. It is told that ‘his feet is on the shoulder of all Saints of Allah’. Today, a concept known as Wahabism pervades many aspects of Islamic life. This concept holds that man can connect directly with his Creator with no need for intercession. This is a product of modern day arrogance coupled with the obsession with rationality that originates from Descartes’ statement, ‘I think, so I am’. Today, man wants to understand the Creator and His creation through arrogance and reasoning and not through submission to His Will. Profound Ayats of the Quran are unwisely interpreted as license to approach the Creator directly thereby falling into the abyss of self-conceit and foolhardiness. And this is the reason of his spiritual emptiness.It is a pity that now-a-days we practice Islam in its outward form but we stray far away from its true purpose and its true beauty. If love is the best and final magic of the Creator then what enchanting love the Saints can lead us to ! Oh, what sense of perfection that one can achieve if one receives the true touch of faith through the Saints. One micro-second moment of glory from the Glory of the Almighty can make a man mad in spiritual ecstasy for the rest of his life. He can achieve success in both worlds, here on this earth, and in the hereafter. This can only be achieved through the intercession of the spiritual Sufi Master, through accomplished Saints, and, definitely, even today, through Ghaus-ul-Azam, who is living, albeit behind the curtain and can be approached through the humble heart. Saints go through various stations in their journey towards union with the Almighty. These stations are known as wilayets, or territories or temporary resting places. The station of a Saint depends on his wilayet and the one of Ghaus-ul-Azam is the highest that can be achieved.